So, did I end up in Spain today? I’d like a big ‘ole bull behind me as I enjoy a lunch, yes? No. I. Would. Not. Where do you think I am? I haven’t a clue. 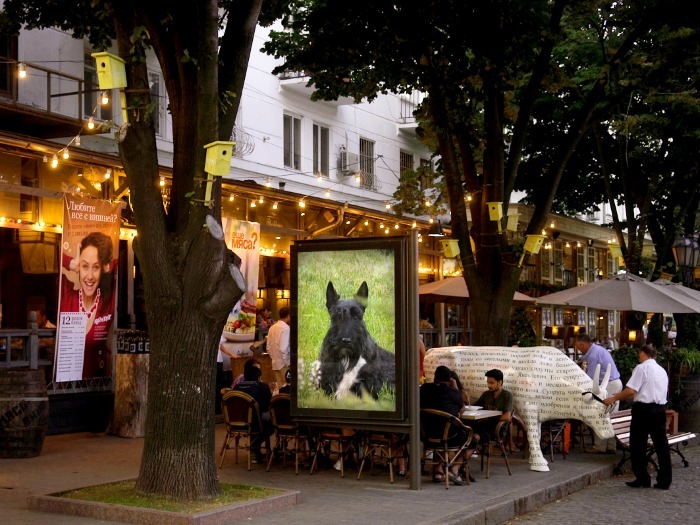 This entry was posted in Terriers, The Scottie Chronicles and tagged dogs, photography, Scotties, Spain, travel. Bookmark the permalink. That bull is wearing glasses, Stuart. If that man would take them off him he’d never know you were there and you could enjoy dining al fresco! I don’t know Stuart but I wish I was there with you, the weather here is too yuck for walkies!!!! I think Montenegro. But look what those nice people did-look at the great bird horses on every tree! Wherever it is, it looks nice for a lunch spot. We have snow today, so your scene is much more inviting. I don’t knows, butts if they’re servin’ margaritas…I’M IN!!! wez got’z a competition’z going’z. so pop’z by. It is interesting looking. We would like to meet you there.